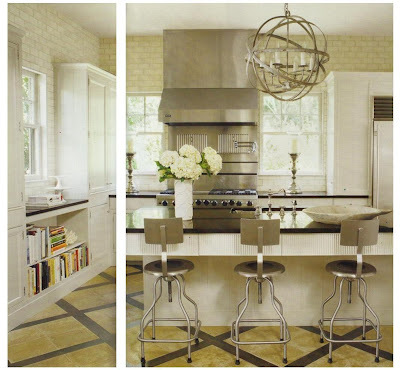 Interior Designer and Owner of a European Antiques Shop, Lisa Luby Ryan's home is filled with Vintage Charm. 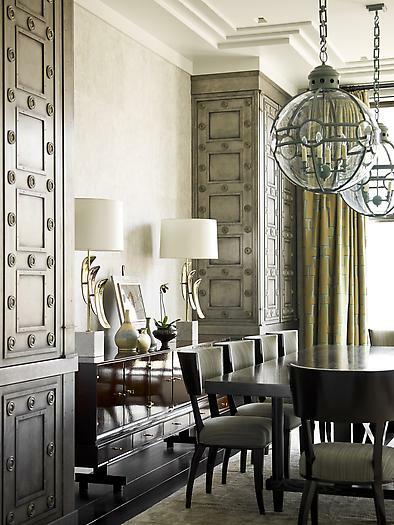 Her Dallas home is French, Belgian and Seaside inspired and is filled with elegant and inviting furnishings in a pale palette. For the holidays, it is decorated with silver, champagne, green and golds in the most beautiful and sophisticated garlands and trimmings. 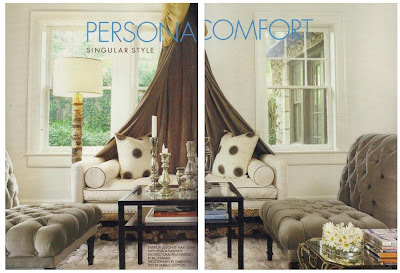 This home was featured in Veranda Magazines 2008 Holiday Issue, and will forever be embedded in my mind. Not just because of my love for green, ok well mostly because of my love for green, but in addition, is how tasteful the overwhelming decor comes together so naturally. 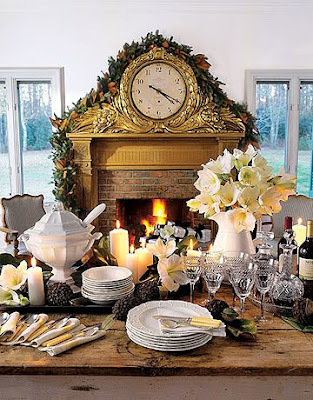 Over sized table arrangements, fresh flowers on the Christmas Tree, overflowing garland on the staircase, even a stag with his own little wreath is all so beautifully festive and very tasteful. Christmas Tree Decorator Billy Milner created a masterpiece with this vintage tree that includes copper tubing as garland, fresh flowers in jars and vintage glass ornaments. 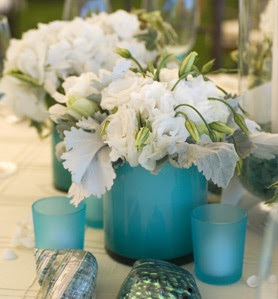 Unfortunately no mention of the floral designer who brilliantly co-ordinated this green and white palette. 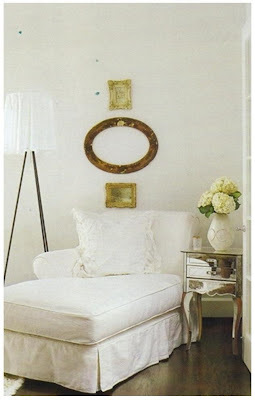 You can visit Lisa Luby Ryan's Website Vintage Linen to see more beautiful products and for the article featured, click here. Yup! Sophie Dahy is having a sale. 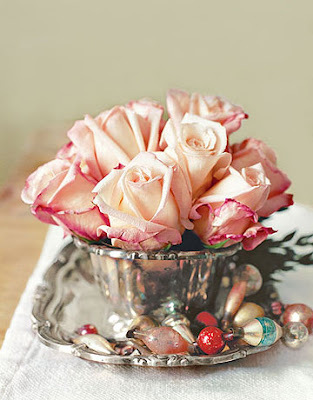 Silk floral Arrangements for the Holidays or Forever ! 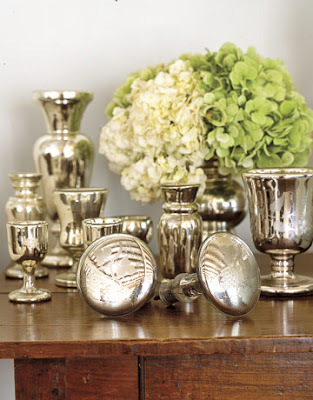 Known for beautiful life like and natural arrangments, Sophie Dahy's stunning collection of one of a kind pieces won't last long at this price. (Discount shown at checkout) I just had to share this amazing offer with you! 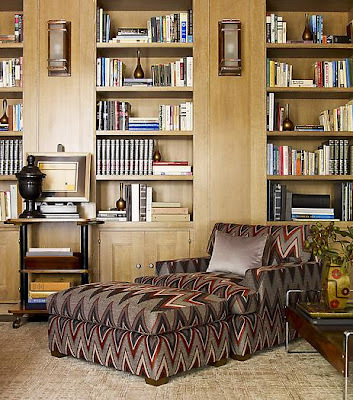 I am thrilled when I stumble across an interior that offers a pleasant surprise around every corner. Some are more subtle than others, but always something beautiful and exciting to take in. 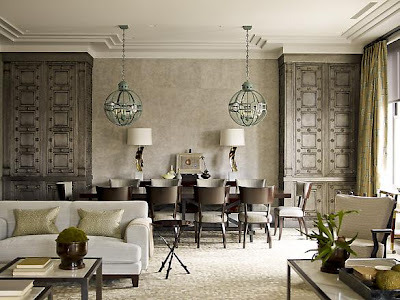 I invite you to experience it here, in this Manhattan townhouse designed by Steven Gambrel. Start with this recurring theme of circles and squares that is carried throughout in panelling, lighting & art. The textures that fill this town create incredible depth, as if you are just sinking into a room. From Wall coverings, (which look like sea grass) flooring, draperies, and seating fabric the selection is superb. The ceiling above is in orange lacquer, and is reflective. This lounge chair below with ottoman covered in Missoni (inspired) fabric is a visual delight. 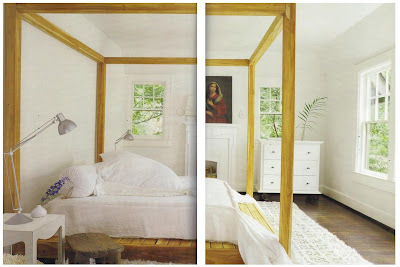 As you would expect from a well thought design, the bedroom is neutral in colour, soft and calming. 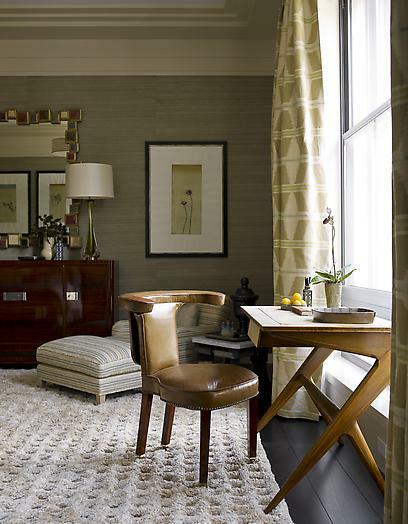 The rug is perfect for bare feet, big and small ones. 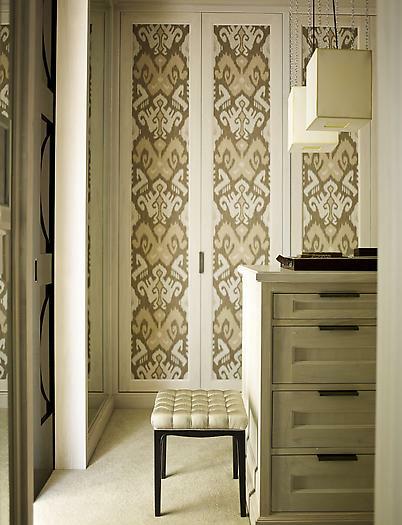 Not included in this gallery are the images of children's rooms, but you can view them here. 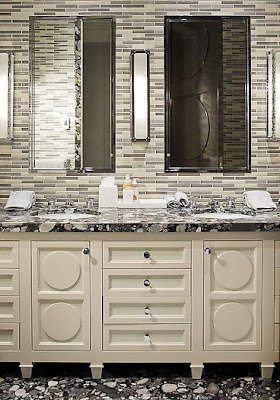 Below is a luxurious bathroom, with glass tile, cabinetry that carries the circle and square theme and gorgeous granite counter and flooring, I have seen this granite many times in showrooms, but have never seen it so beautifully as in this application. I am finally ready to start thinking about Christmas. I don't like to start too early because I'll tire of it before it gets here. 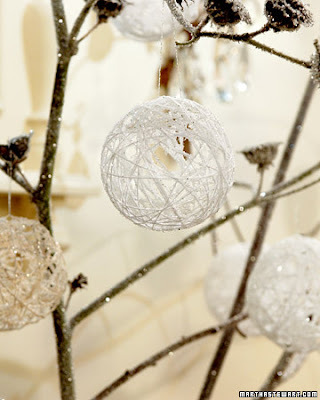 This weekend I am off to look for a couple of decorations to add to my small collection.. 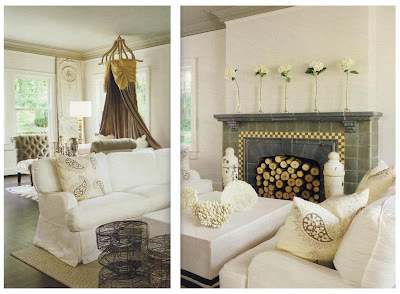 While browsing for inspiration I completely side tracked with these images, that I know my readers who love white will adore. That's you Charlie ! 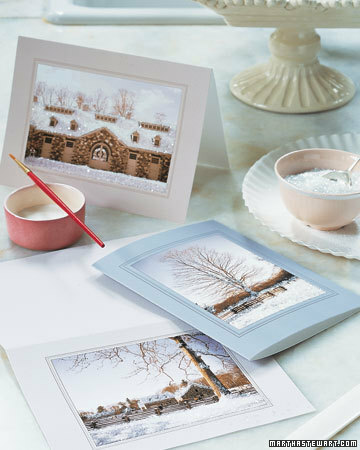 They are absolutely beautiful because they remind me of that first snow fall, you hope will arrive just before Christmas. I have truly come to appreciate the beauty of layering white over the past year. 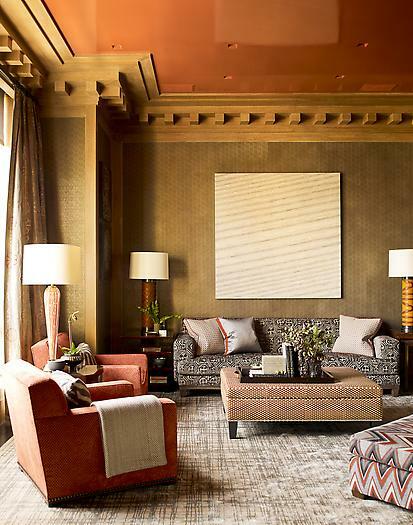 Various tones, with different textures, finishes and fabrics can create a very warm and inviting space. 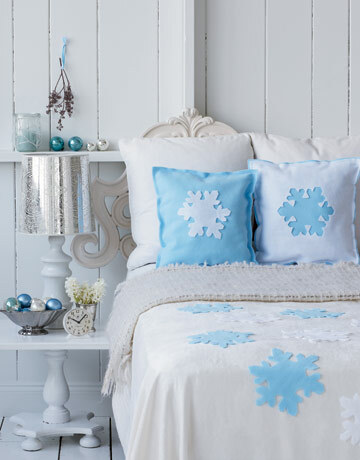 And for those readers who would die without colour, I have added a touch of Ice Blue. This one is for your Erin! 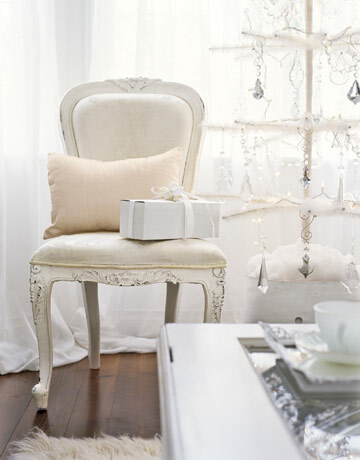 I'll be posting on some of my favorite Holiday Decorating articles next week. Kathy at Creative Home Expressions ! Kathy Passarette is an Interior Designer from Long Island New York. 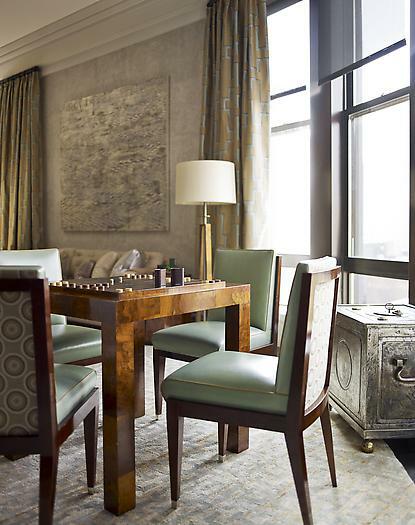 In addition to Interior design, she offers home staging and colour consultations. Her blog, Creative Home Expressions, is filled with design inspiration, updates on recent projects, tablescapes and so much more. She is incredibly generous, and is always hosting giveaways on her blog. I am thrilled to see that she is the recipient of this wonderful gift! 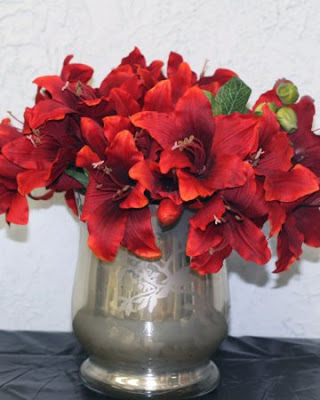 Kathy's choice for the Sophie Dahy Giveaway, the Red Amaryllis in a mercury Vase! 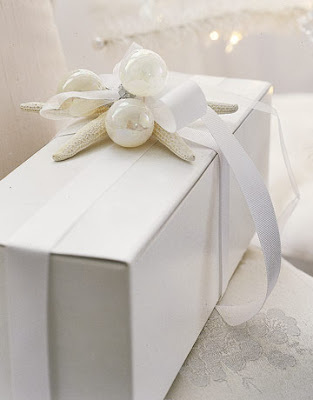 It will be a wonderful addition to her Holiday Decor this season. 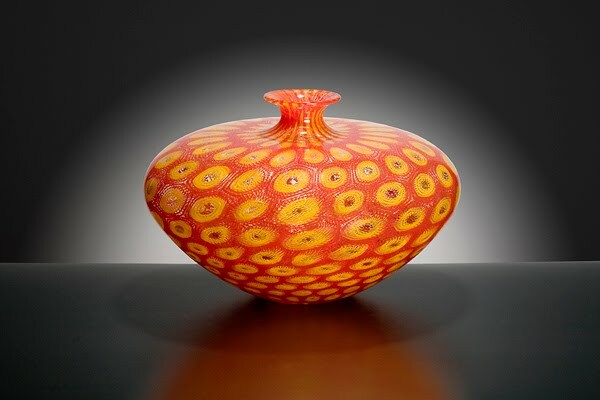 If you have ever been fortunate enough to wander the streets of Venezia aimlessly, you'll understand how easy it is to fall in love with all things from blown glass. Rows and rows of little glass shops, with everything from vessels to pendants. 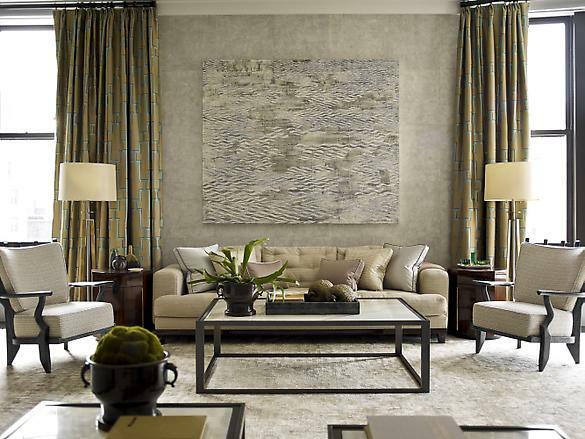 Rich in colour and depth and with a captivating reflective nature. Each piece unique, and made by hand, there will certainly be one (or many) that call to you. 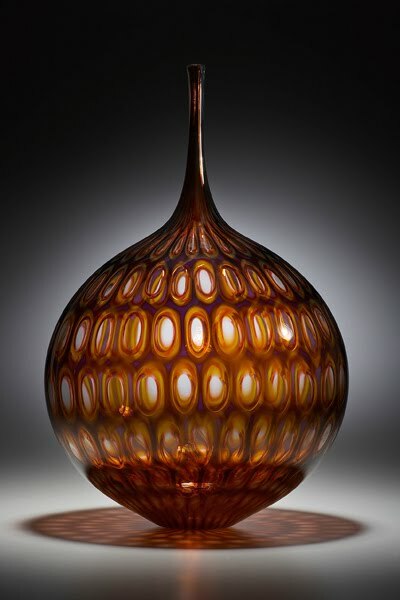 The art of glass blowing actually dates back to as early as 50 B.C. and over the years the technique has spread around the world. The artist's work featured here is Sam Stang. 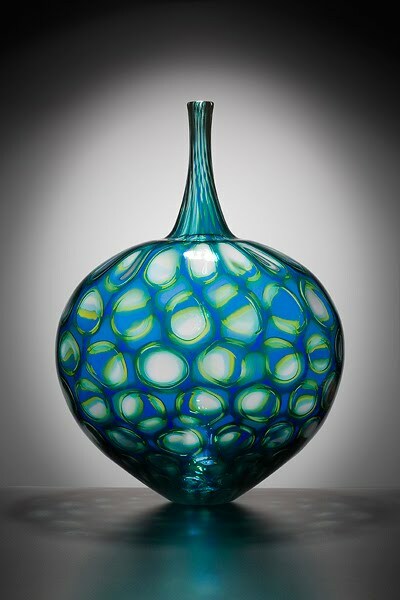 Mr Stang is the owner of a wonderful glass boutique called Augusta Glass Studio (in Augusta Missouri) His work is brilliant, and he uses colour and shape in the most beautiful pairings. 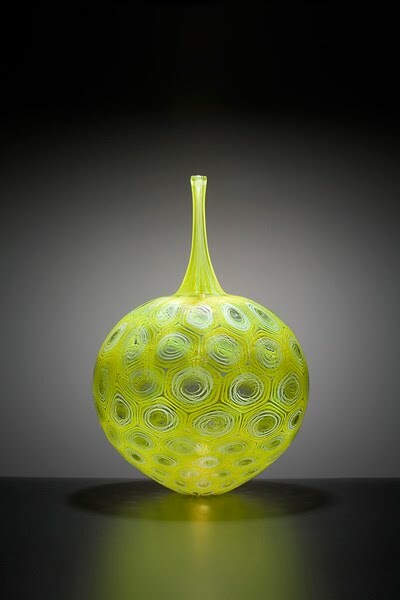 He uses traditional European glass blowing techniques and often requires a team of 2 or 3 to complete a piece. It's worth a visit to his website, especially if you are in the Augusta area. 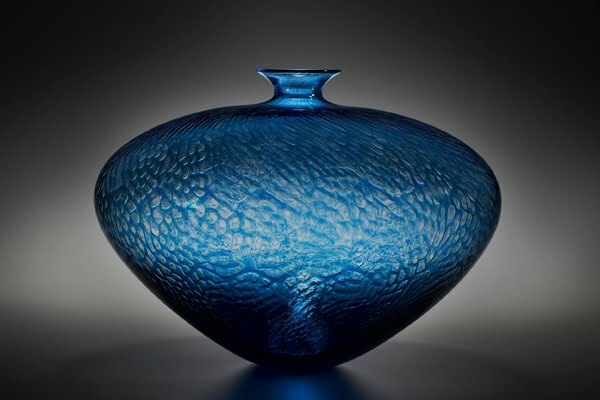 He is having a sale on the first 2 weekends of December, AND there will be a Demo... Ahhh.. just like they do in Murano. 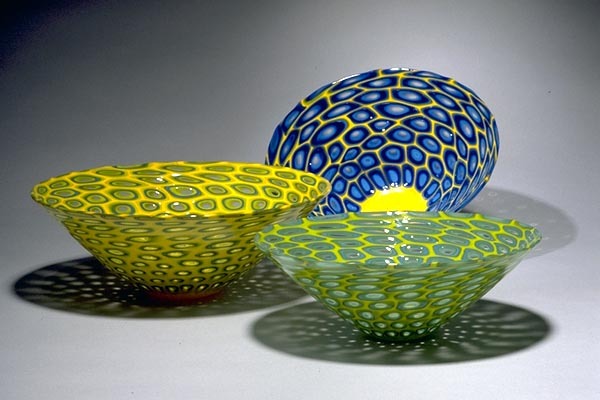 The complicated process in which colour is added in these striking patterns is called Murrine. It makes for a very exciting piece of art that is one of a kind and will be cherished for years. 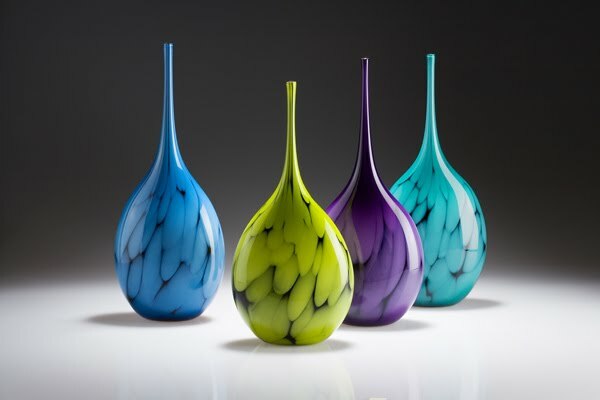 Hand blown Glass objects are to be treasured and handed down for future generations to admire. The limitless colour options, striking patterns, and incredible shape will add a sophisticated element of design to any interior. 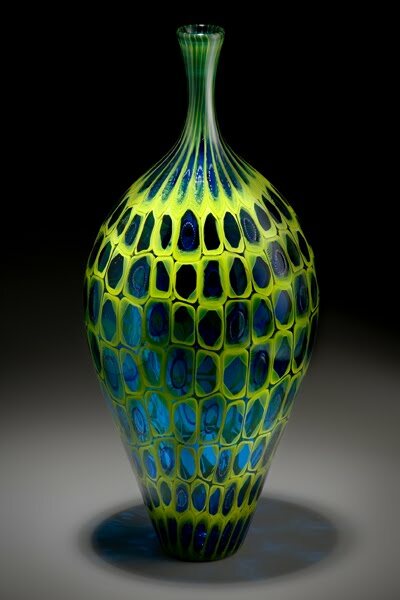 All photos taken from the Sam Stang Augusta Glass Studio. 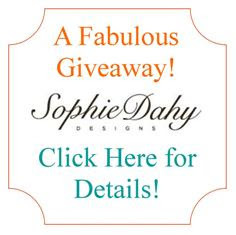 Just a couple of days left on our incredible Sophie Dahy Giveaway, so please take the time to enter to win the Silk Floral Arrangement of your choice. Up to $300 Value ! Click here for details ! I couldn't resist doing a post on some Elegant Holiday Table Settings. Especially Since there are still 5 days left in our incredible Sophie Dahy Giveaway. 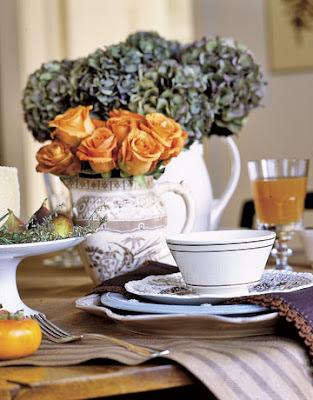 If you have yet to enter, browse today's post for inspiration and then head on over to the giveaway post, to find the perfect arrangement for your Holiday Table. You get to pick the arrangement you want to win ! What a lovely Soft Pink Christmas table setting. 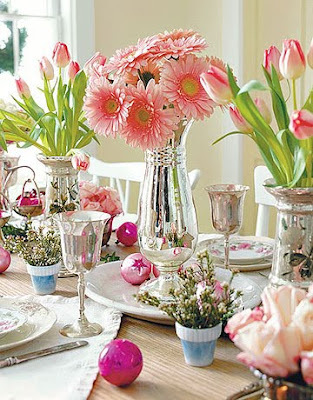 Pink Gerbera Daisies and Tulips look so refreshing on this Bright Holiday Table. 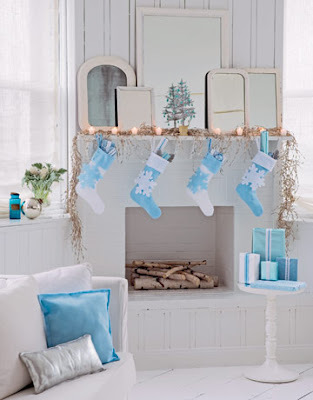 Blue is this year's hottest accessory colour. Peacock, turqoise, Cobalt. 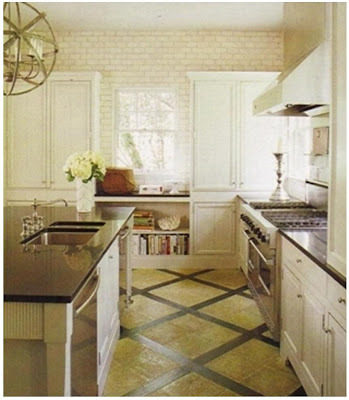 Have a little fun mixing them with punches of orange or yello, OR keep it classic with white. 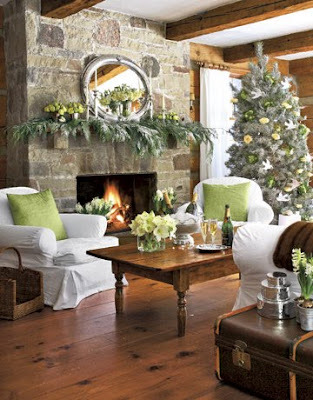 This picture stole my hear because it has a wonderful wood burning fireplace, a rustic wood table top, and flowers set in a pitcher. 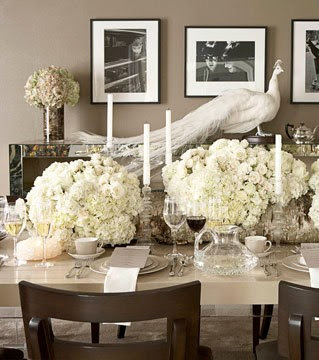 There is no such thing as floral overkill, at least not with white. Definitely a plated dinner here. 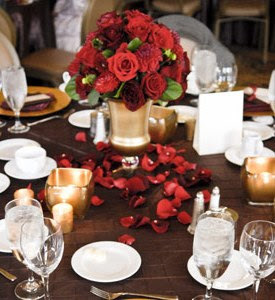 These large arrangements make for a very formal and elegant evening. I hope you have been inspired. Good luck with our Giveaway, and Happy Browsing!